One of our favorite places on the island is our own Sanibel Lighthouse. 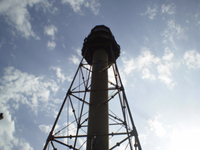 Located on the eastern end of Sanibel, the lighthouse can be seen for miles and has become a true landmark. The lighthouse also has a pretty cool history to go with it. 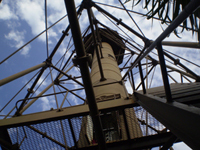 This was the first lighthouse on the west coast of Florida and was completed in 1884. The shallows extending offshore from the lighthouse, and the entrance to San Carlos Bay, made a strong case for getting a lighthouse built at this location. Locals asked Congress for funding to build the lighthouse and it took over 20 years before $50,000 was appropriated for the project. The project was almost halted when the ship carrying the iron sank just two miles from Sanibel. Luckily, divers recovered most of the iron and it was finally finished and lit on August 20, 1884. The structure stands at almost 100 feet and is accessed by an external iron stairway. 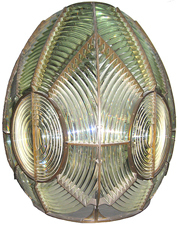 The first lens was what's called a "third-order Fresnel lens" (pictured), which could take a little light and focus it into a long distance beam. In 1923 the light was converted from kerosene to acetylene gas, as well as modernizing the attached two homes with indoor plumbing and bathrooms. The lighthouse was automated in 1949. 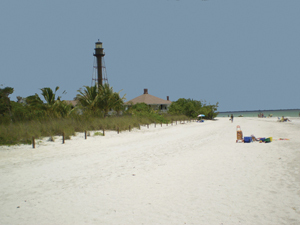 Shortly after the causeway was finished (1963) the Sanibel Lighthouse was electrified and, shortly after that, accepted into the National Register of Historic Places. The Coast Guard wanted to turn off the lighthouse in 1972, but locals made their intentions clear and the lighthouse was kept shining. 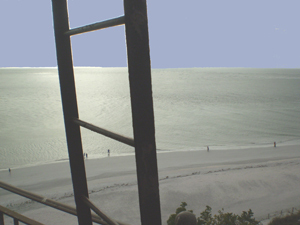 In 2010 the lighthouse was officially transferred to the City of Sanibel. City employees live in the attached buildings and maintain the grounds. Even with all this, mostly what people think of when looking at the structure are the miles and miles of incredible beach with views in all directions. 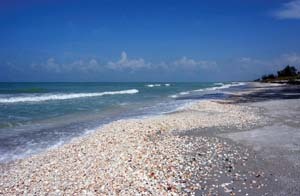 Parking is plentiful and visitors can find everything from a large fishing pier to some incredible beach shelling! 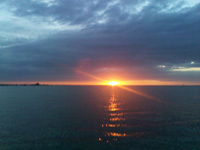 Boats can anchor for the night behind the protection of the island in a truly picturesque setting.